Beautifully engraved unissued certificate from the Boston Golf Club Company, Limited dated 19XX. the certificate was printed around 1920. 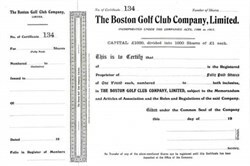 Founded in 1900, The Boston Golf Club has been located at Cowbridge, Boston ( U. K. ) since 1962, having being situated at a number of locations in and around Boston.